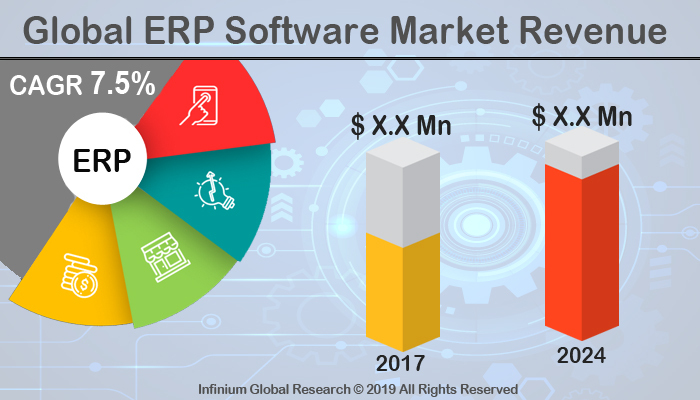 A recent report published by Infinium Global Research on ERP software market provides an in-depth analysis of segments and sub-segments in the global as well as regional ERP software market. The study also highlights the impact of drivers, restraints, and macro indicators on the global and regional ERP software market over the short term as well as long term. The report is a comprehensive presentation of trends, forecast and dollar values of global ERP software market. According to the report, the global ERP software market is projected to grow at a CAGR of 7.5% over the forecast period of 2018-2024. Enterprise resource planning (ERP) the software is a business process management software. This software enables the management of several functions related to technology, services, and human resources. This software ingrate the various operations including development, planning, sales and marketing with the single database or the user interface. It helps to collect, store, manage and interpret data from various business units. Thus, this will further enhance the efficiency and profitability of products at lower costs. The growing demand for transparency and efficiency in the business processes are driving the growth of ERP software market worldwide. In several industries, the tracing of the flow of the working process is becoming needed to obtain optimum transparency. The ERP software allows the manufactures to track the manufacturing processes, life-cycle, which reduces the possibility of errors. The rising demand for ERP software from the small and medium scale enterprises are expected to fuel the growth of this market in the developing regions. Furthermore, ERP software reduces the operational costs of the product without affecting its quality and services. Thus, these factors are contributing to the growth of the ERP software market. In addition, growing adoption of cloud-based or the mobile-based ERP software are anticipated to boost its demand in the small and medium enterprises. However, the high initial cost is expected to hamper the growth of EPR software market. Moreover, the rapidly changing business models and growing awareness about the benefits of ERP software are projected to create several growth opportunities in this market over the forecast period. Currently, North America dominates the global ERP software market and is followed by Europe. The factors such as the presence of major players, high adoption of new and advanced technologies are the primary factors the drives the growth of North America ERP software market. In addition, Asia Pacific is the fastest growing region in the ERP software market owing to the expansion small- and medium scale enterprises in the emerging countries. The report on global ERP software market covers segments such as deployment, function, application, and end-user. On the basis of deployment, the sub-markets include cloud deployment and on-premise deployment. On the basis of function, the sub-markets include customer relationship manager, accounting and finance, human resource, and sales. On the basis of application, the sub-markets include IT and communication, BFSI, retail, education, healthcare, manufacturing, and aerospace and defense. On the basis of end-user, the sub-markets include small enterprises, medium enterprises, and large enterprises. The report provides profiles of the companies in the market such as SAP SE, IBM Corporation, Microsoft Corporation, Sage Group Plc, Focus Softnet, Epicor Software Corporation, PLEX SYSTEMS, NetSuite Inc, Oracle Corporation, and Infor. The report provides deep insights into the demand forecasts, market trends, and micro and macro indicators. In addition, this report provides insights into the factors that are driving and restraining the growth in this market. Moreover, The IGR-Growth Matrix analysis given in the report brings an insight into the investment areas that existing or new market players can consider. The report provides insights into the market using analytical tools such as Porter's five forces analysis and DRO analysis of the ERP software market. Moreover, the study highlights current market trends and provides forecast from 2018-2024. We also have highlighted future trends in the market that will affect the demand during the forecast period. Moreover, the competitive analysis given in each regional market brings an insight into the market share of the leading players.